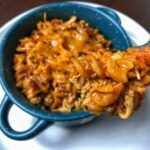 It may seem like an odd combination of flavors, but this healthy BBQ chicken pasta bake is delicious. Luckily I have one of the world’s pickiest eaters living under my roof to confirm this. Anything that gets her approval I feel comfortable stamping as officially delicious. Believe it or not, this is the first pasta recipe on my site. That’s right, out of nearly 200 recipes, I’m just now touching pasta. It’s taken me this long because quite frankly, I don’t like pasta. Anything that packs a ton of calories into a relatively small amount of food, I usually try to stay away from. When I eat, I like to eat, eat, and eat some more. But I’m here to help you add healthier recipes to your food repertoire. So for all the pasta lovers, there will be more healthy pasta recipes on the way. In the case of this healthy BBQ chicken pasta bake, you’ll have a high volume, single-serving (or double depending on your appetite and calorie needs) pasta dish under 500 calories. With 60 grams of protein, you can take a guess at how filling it is. And while it’s hard to eliminate carbs altogether without using an impasta (get it?) that really doesn’t taste anything like pasta, this recipe checks in with only 40 grams of carbs. That’s totes manageable, right? Banza Chickpea Pasta: 190 calories, 14 grams of protein, and 32 grams of carbs. Barilla Protein Plus Rotini: 210 calories, 10 grams of protein, and 38 grams of carbs. 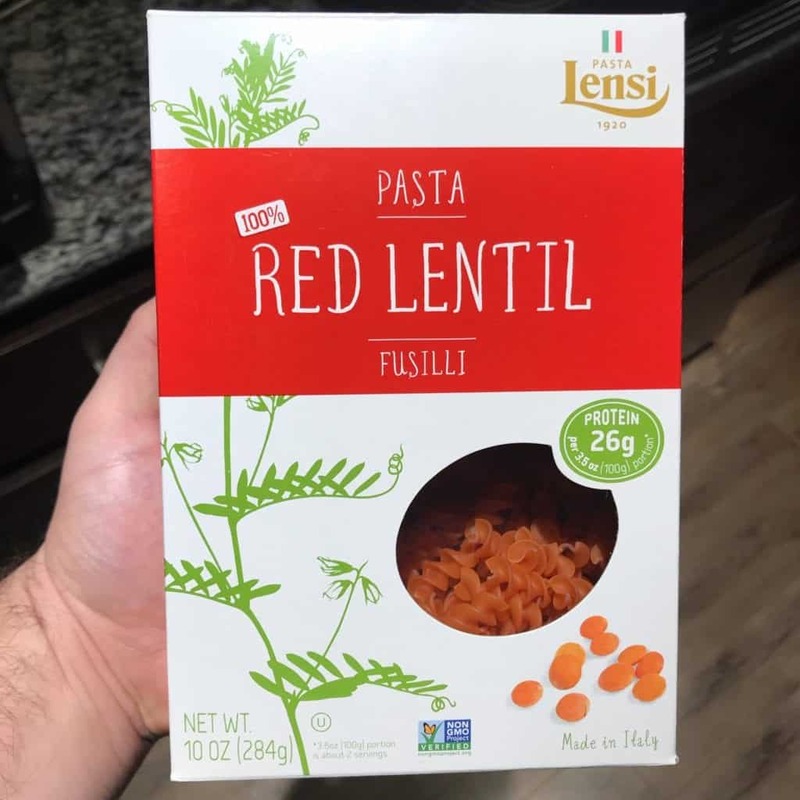 There are a ton of higher fiber and protein pasta products available now. Just take a look at the nutrition labels on your next shopping run and experiment. Notice I said nutrition labels and not the marketing on the front of the box. Don’t be fooled into thinking the organic spinach pasta with 1,000 grams of carbs per serving is a good option. Note about cooking pasta in the microwave: The recipe gives instructions for microwaving a single serving. You can certainly cook it on the stovetop all the same. For the chicken, the recipe calls for cooked chicken. If you shop at Walmart, you could use a product like you see below. You could also make your own in a slow cooker. 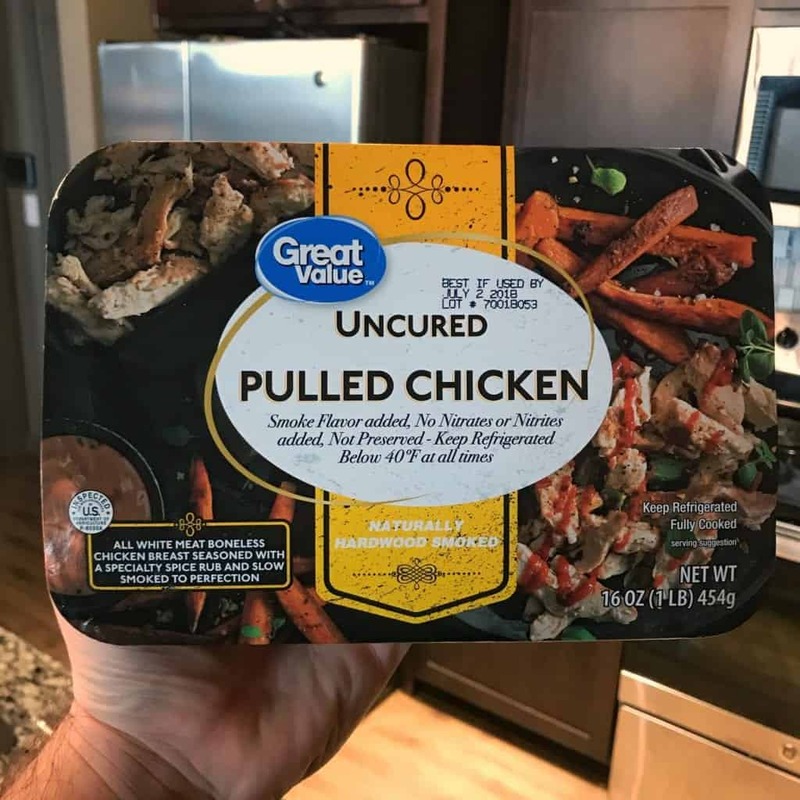 Just add 2-3 pounds of boneless, skinless chicken breast in and cook on low for 6-8 hours or on high for 3-4 hours and shred with two forks once it’s cooked through. Adding something like liquid smoke could even give you the smoked chicken flavor. Beyond the chicken and pasta, the only other ingredients are BBQ sauce and the optional cheddar cheese. The recipe calls for a sugar-free BBQ sauce from G Hughes. It has 20 calories per 1/4 C so if you’re going to replace it with another option, be sure to note the additional calories and carbs. And if you decide to leave the cheese off, your final macros would look like: 440 calories, 57 grams of protein, 40 grams of carbs, and 6 grams of fat. 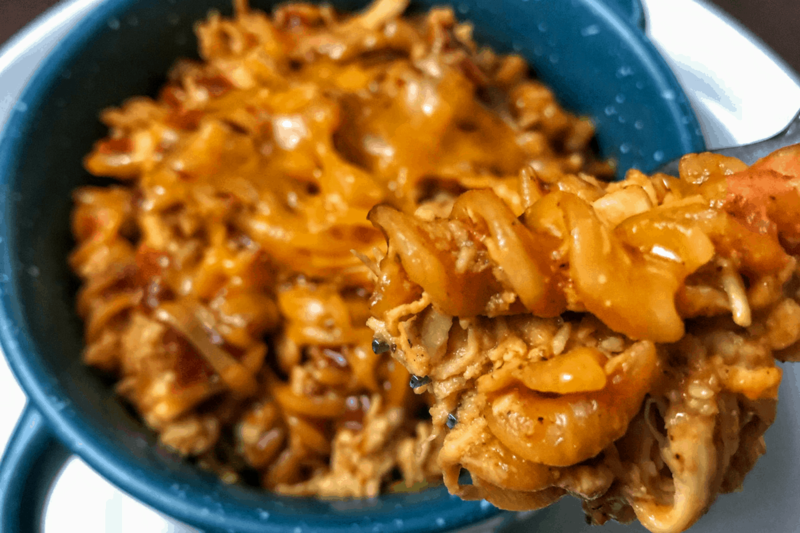 A simple recipe for high protein BBQ chicken pasta that's entirely microwaveable. Begin by cooking the pasta in the microwave. For a 2-ounce serving of pasta, use 2.5 C water or enough to cover the pasta with a few inches of water. Place a paper towel or plate underneath the bowl to catch any water that boils over. Cook times may vary depending on how much pasta you cook at once, but the 2-ounce serving should take about 8-10 minutes in the microwave. Test the pasta and adjust cook times according to your taste. Drain the remaining water from the pasta. After the pasta has cooked, reheat your pulled chicken. Add the BBQ sauce to the pasta and stir well. Add the reheated chicken to the BBQ pasta and stir. If you're adding cheddar cheese, microwave for an additional 30-60 seconds to melt the cheese on top. Add salt, pepper, and other seasonings to taste. Serve warm. Like I mentioned in the intro, more healthy pasta recipes are on the way. If you’d like to subscribe to my email newsletter, I’ll be sure to let you know when they’re published. 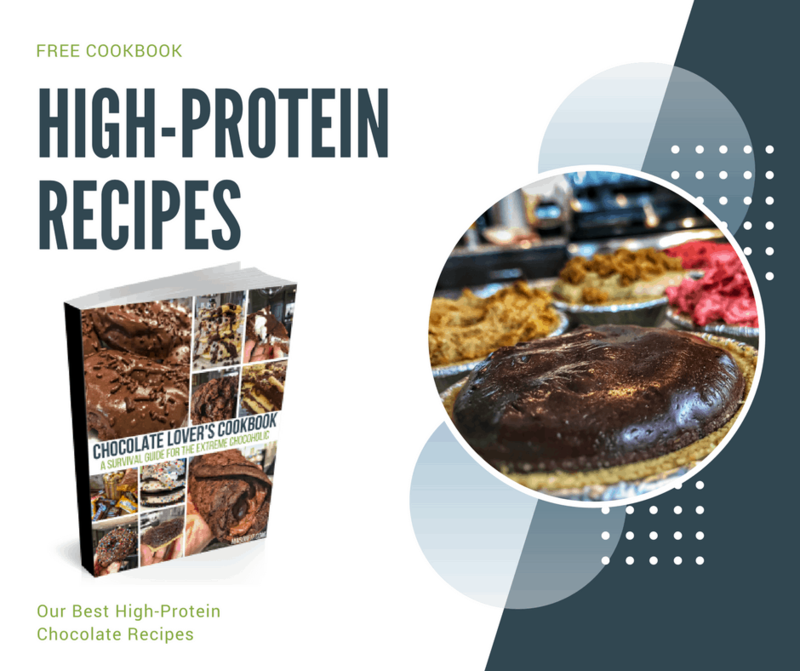 You can enter your info below to subscribe and have my free high protein cookbook for chocolate lovers sent to your inbox right away. And if you’re on Instagram, you can follow me here for another way to stay up to date. Love this! I’d use Spaghetti squash myself but would do the Barilla for Hubby. I’ve also been mixing the Walden Farms BBQ sauce 1/2 and 1/2 with the G Hughes BBQ so it cuts the tiny cals by that much more. Awesome recipe thanks again for all the great ideas and for putting them out there for us – means a lot that you don’t charge for them like some others do. Love how quick, easy, tasty this recipe is and is ingredients I always have on hand! I’ve been making it at work a lot lately for lunch. I use Banza rotini pasta in mine though. Just a personal preference.